Here are some of the best products under the “water” umbrella. These days, the more water a product can save, the better. Whether it’s a toilet, faucet, showerhead, or lawn-irrigation system, preserving water is now vital, especially in areas of the country where drought and local restrictions have made conservation a must. Consumers are catching on: Water-efficient products like dual-flush toilets and low-flow showerheads were ranked as desirable by 53% of respondents in a recent NAHB survey, while tankless water heaters were desired by 51%. Many builders have turned to the EPA’s WaterSense program and certified products to help them construct water-efficient homes that can allow a family of four to save up to 50,000 gallons of water per year, in addition to as much as $600 per year on utility costs, according to the agency. From no-touch flush toilets and faucets that deliver near-boiling water instantly to showerheads that can be controlled via Wi-Fi, the following products aim to simplify homeowners’ lives while increasing comfort and helping to conserve one of the world’s most precious resources. 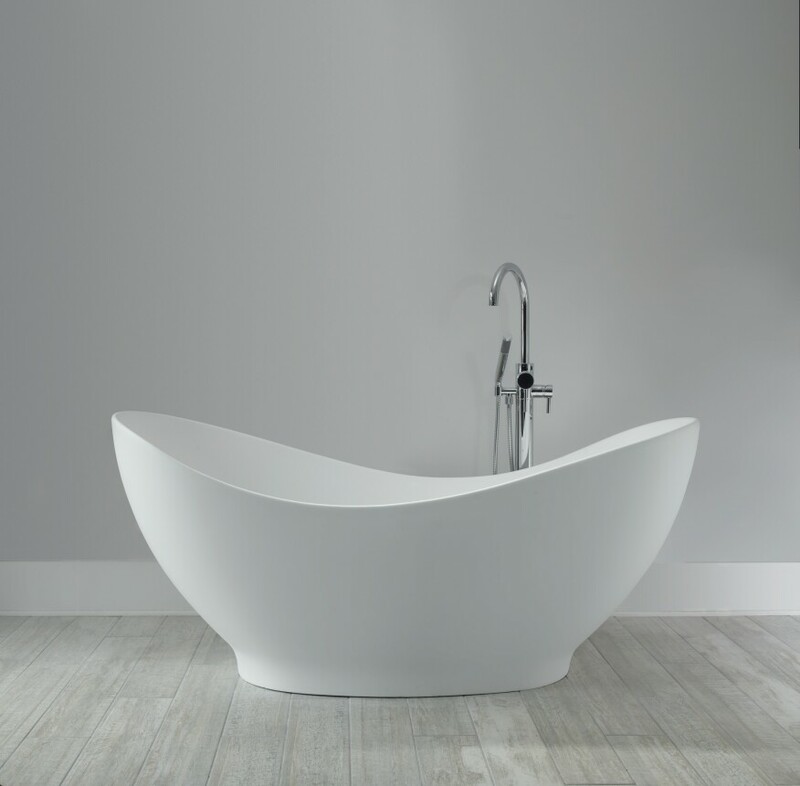 MTI’s juliet 2 bathtub is a petite version of the Juliet model that boasts the same organic design and fluid lines of the larger model. Made from MTI’s non-porous Engineered Solid Stone material, it features an integral pedestal and integrated slotted overflow. The Juliet 2, which measures 66 inches by 29 inches, is available in white or biscuit with a matte or high gloss finish. 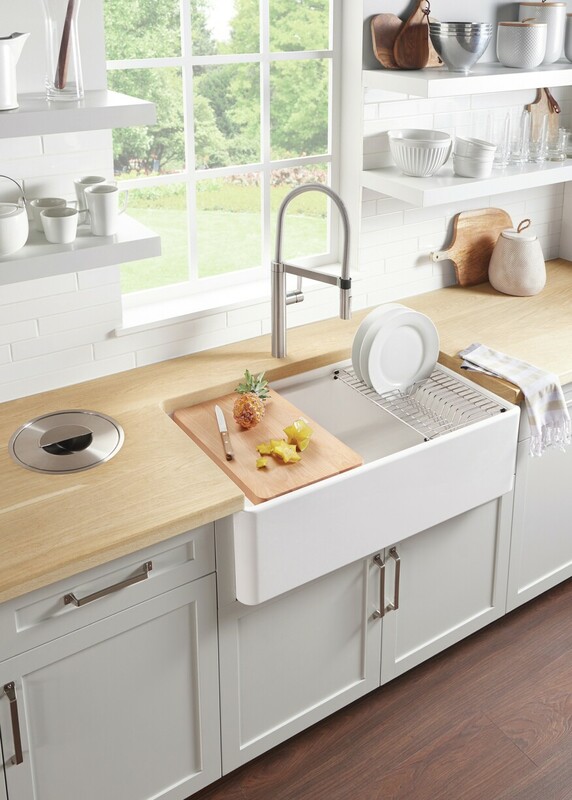 The Profina is a farmhouse sink with a modern twist. 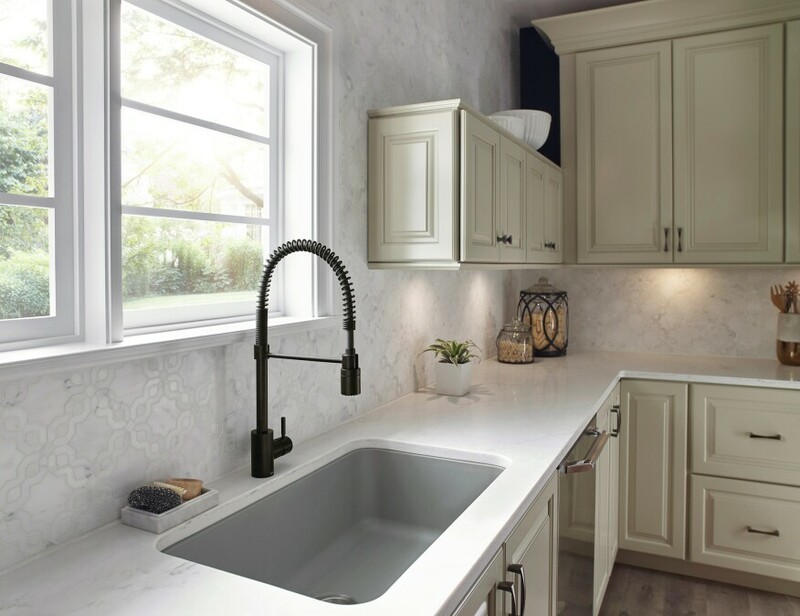 This 36-inch galley-style apron front sink, crafted of the company’s durable fireclay material, features an iconic farmhouse look, with thin walls that give it a contemporary feel. Its accessory ledge allows for custom accessories to fit within the sink, saving counterspace. The sink is designed to meet the complex demands of today’s modern, hardworking kitchen with an easy-to-clean, smooth surface that maintains its feel through the years, the firm says. Its center drain location makes the process of stacking and washing dishes a simpler task. The sink comes standard with the limited lifetime warranty. Debuting this year, all Greentherm 9000 Series tankless water heaters feature sleek, rounded corners on the metal cabinet, making these water heaters as beautiful as they are energy efficient, the company says. 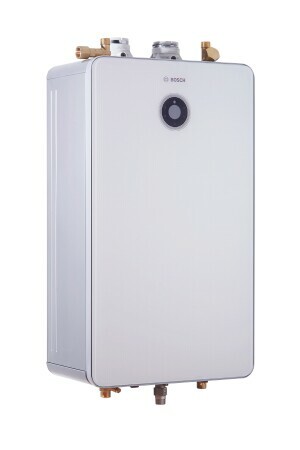 They are installed with innovative top connections, and the premium Greentherm 9900i SE model has a unique glass front and integrated Wi-Fi control (available as options on other models), enabling the homeowner to control the water heater remotely with a free app. 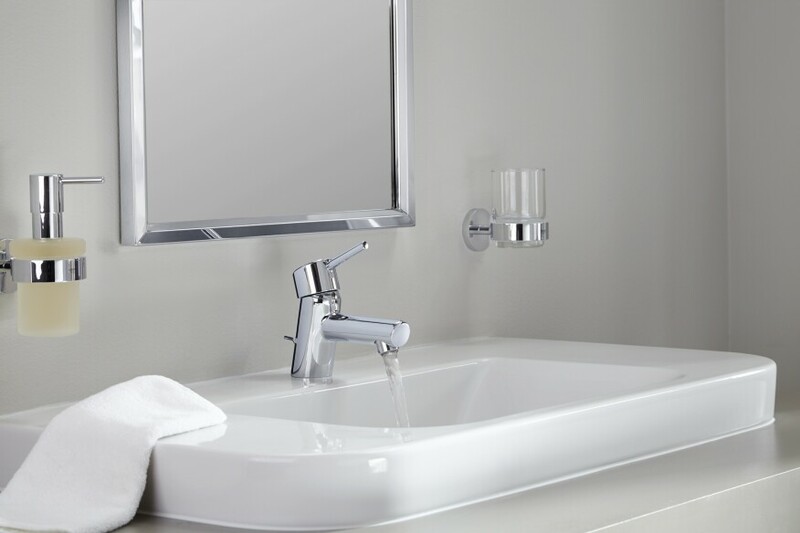 The Concetto bathroom faucet collection is not only sleek in design but also built with functionality in mind—its dual spray can be operated with one hand while its lever’s 6-inch adherence makes for easy access for all users. The collection includes the Concetto XS single-hole faucet, Concetto wide set three-hole faucet, and Concetto L single-hole faucet. 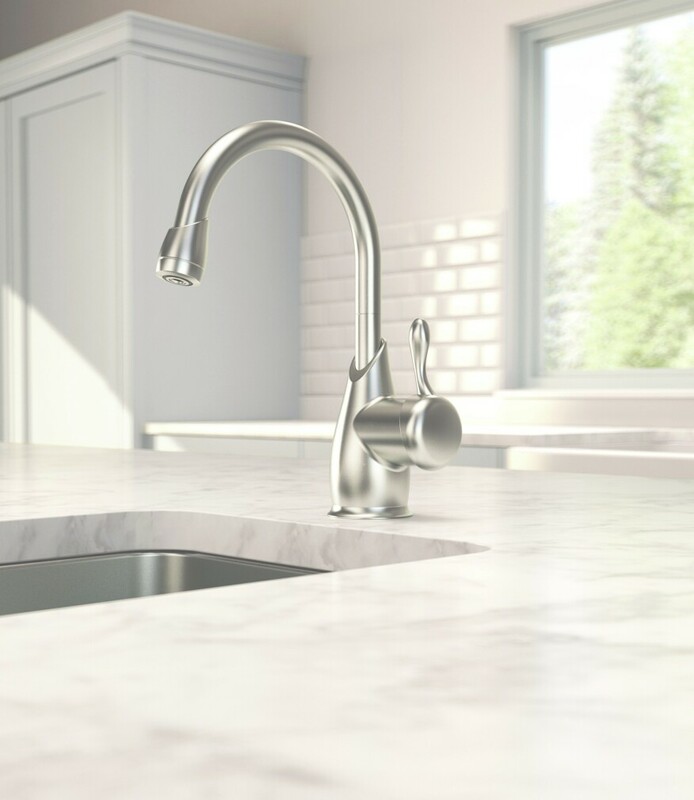 The faucets feature the company’s latest technologies, including SilkMove for precise, smooth handling and its scratch-resistant StarLight finish. The Foodie faucet swivels 360 degrees to give users the flexibility to put the water stream right where they need it. The model features a spring-action wand commonly seen in commercial kitchens while the scale of the faucet makes it a match for any sized home kitchen. An easy twist of the spray head allows the user to toggle between a single steady water flow to a powerful spray. The Foodie has a 209/16-inch-high spout and comes in chrome, stainless steel, and satin black finishes. InSinkerator’s new beverage faucets—also known as instant hot water dispensers—bring the heat. The Melea and Iris dispensers deliver near-boiling filtered water quickly and conveniently, so users can spend more time doing other things in the kitchen. Available in high-end styles that aim to enhance both traditional and transitional kitchens, units are compatible with the company’s F-2000S water filtration system that reduces particulates, chlorine taste, lead and other impurities allowing users to enjoy better-tasting hot beverages. 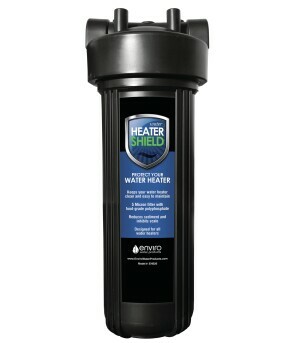 The Water Heater Shield protects tankless and traditional water heaters from damaging scale. Installed on the feed water line just prior to the water heater, the unit’s 5 micron filter removes dirt, silt, and sediment, the company says. Siliphos media within the filter chamber prevents scale and stops corrosion by forming a thin protective layer on the element, lining, and other surfaces. The product protects against hard water damage, which can cause potentially costly repairs and raise energy costs. Kohler’s Real Rain showerhead emulates the feel of warm rain in a way that is dictated by the user’s desires. Real Rain’s nozzle geometry mimics rainfall by adjusting the size of water drops, as well as the rate at which they fall. Intensity of the spray grows throughout the shower, and users can choose to enable the Deluge feature, which releases water gathered in the shower’s reservoir. 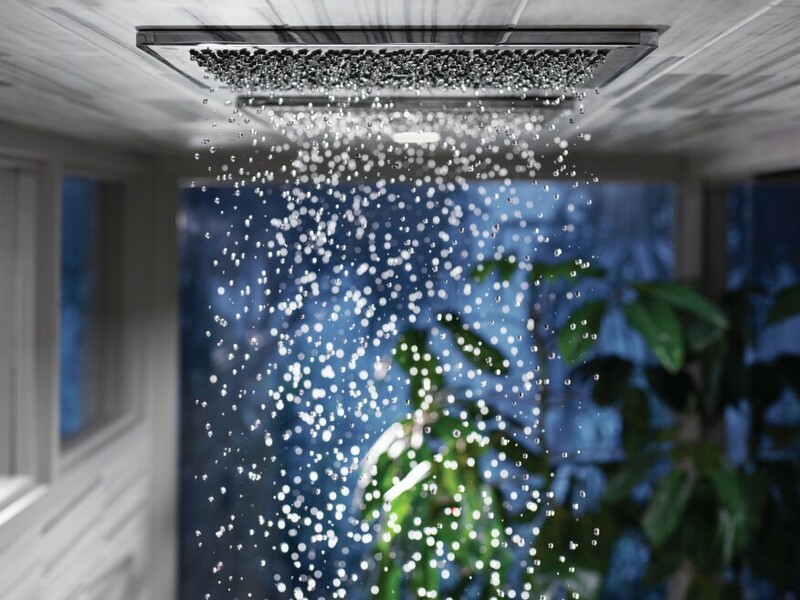 Real Rain uses a minimalist, ceiling-mounted 19-by-19-inch square panel, and has a flow rate of 2 gpm. 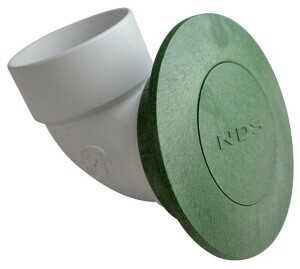 Pop-up drainage emitters from NDS allow water captured by grates, catch basins, channel drains, downspouts and gutters to flow through drainage pipe and away from structural foundations. The emitter opens under minimal hydrostatic pressure from water through upstream drainage pipes and closes as flow diminishes. Since it is closed during dry weather, debris and rodents cannot enter drain pipes, and its flat profile blends discreetly into the surrounding landscape. The HydroRain 2-in-1 Shower Head provides users with a different type of shower experience. The product features an overhead raincan, which can run separately from, or simultaneously with, the showerhead, giving users the warmth and flexibility of two streams of water at once. The unit is designed to fit a standard shower arm and can be installed in minutes, the company says. 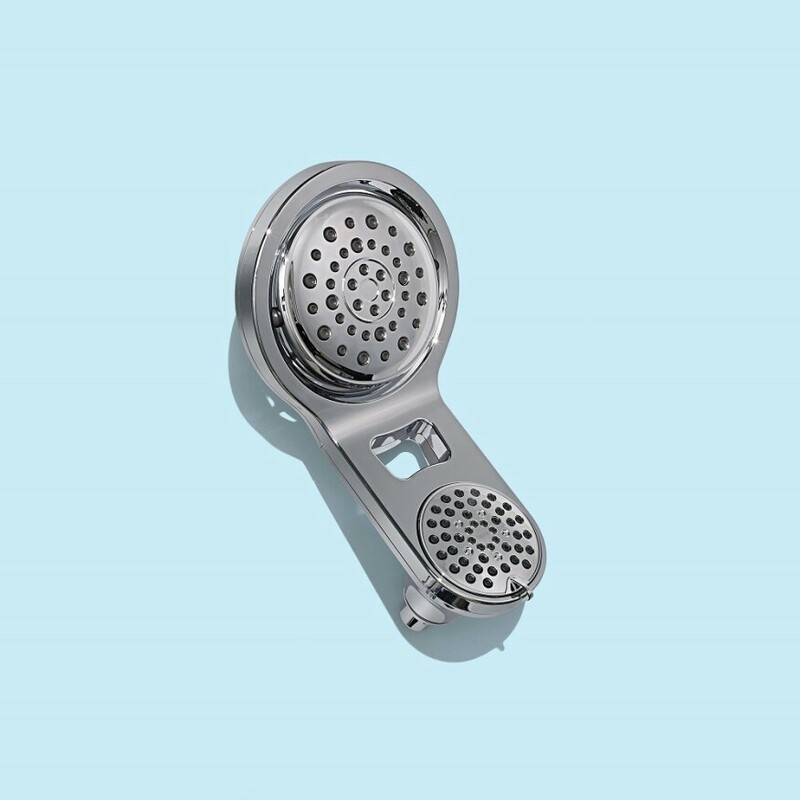 The shower head is WaterSense labeled and flows at a rate of 2.0 gpm, providing 20% water savings when compared to industry standards, according to the firm. Additionally, soft rubber spray holes ensure easy removal of calcium and lime build-up from the spray face with the touch of a finger. Available in five spray settings—full spray, massage spray, full spray with massage, shampoo rinsing spray, and pause—the HydroRain is offered in chrome, stainless, Venetian bronze, and polished nickel finishes. 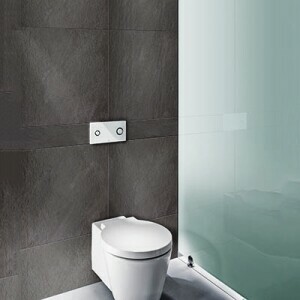 Viega recently debuted its flushing technology in the U.S. Its in-wall systems, like the Viega Eco Plus WC carrier, conceals plumbing and offers possibilities for builders, architects, and designers planning a bathroom. The Viega Eco Plus WC carrier is installed in the wall and has a powder-coated steel frame, concealed cistern, 3-inch PP drain elbow, fernco coupling, mounting hardware for 2×4 wood or metal studs, bowl mounting kit, and trim guards. It can be mounted at varying heights. 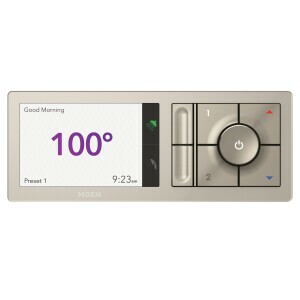 The wi-fi/cloud–based U by Moen shower includes a digital valve that offers precise, thermostatic temperature control and enables the user to connect up to four shower devices such as showerheads, handshowers, and body sprays. Its digital controller features a 5-inch LCD screen that provides feedback on the system’s status. As the water temperature increases, the screen changes colors indicating the system is warming up or cooling down to reach the desired water temperature. Featuring the company’s patented air- and water-­based technology, the Stealth Phantom Toilet does not sacrifice performance, the firm says. At 0.8 gpf, the WaterSense-labeled toilet is the lowest gallon toilet on the market, the company says, along with Niagara’s entire line of WaterSense-labeled Stealth Single-Flush toilets. 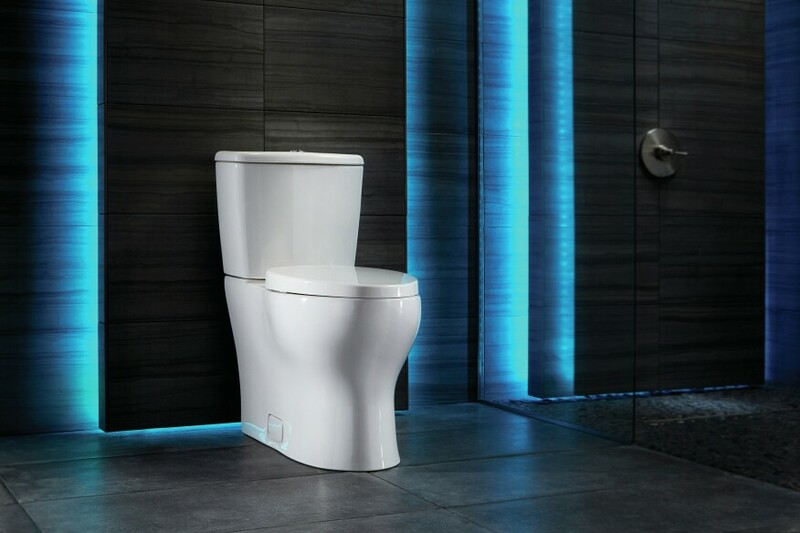 The key to the toilet’s performance is its patented air transfer tube, which allows for a vacuum-assisted pull during the flush and accelerates the force of the water and waste flowing through the trapway. It comes in white and its EZ Height design makes it easier to sit and stand. SharkBite Plumbing’s PEX pipe system is designed to fit a variety of fittings, PEX pipes, outlet boxes, valves, and other accessories required to install a complete plumbing system without the need for special tools and with less time. 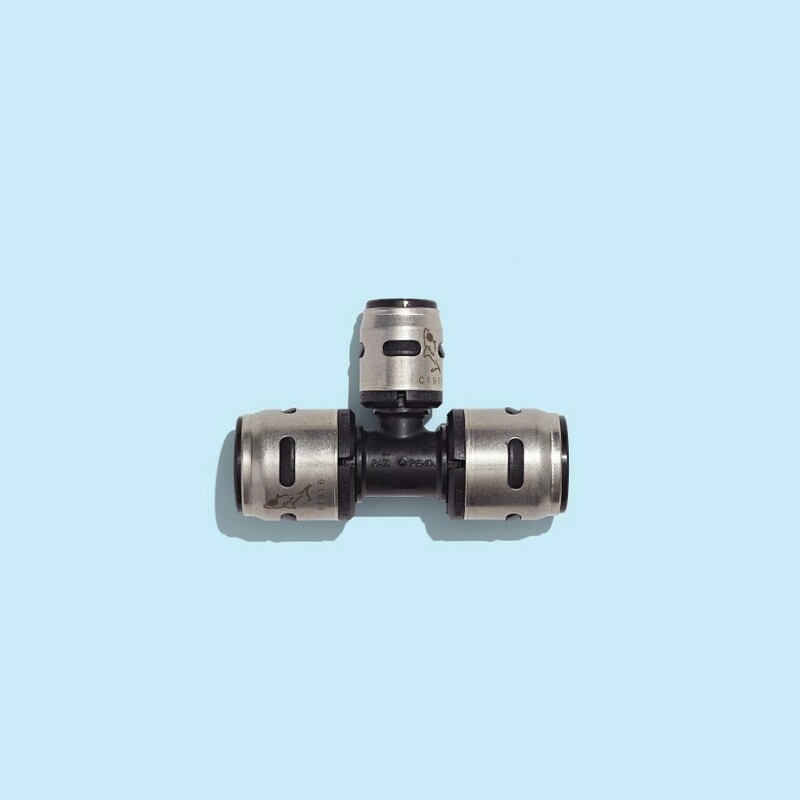 The EvoPEX pieces are made from high-performance polymer, and feature a green-colored visual indicator to ensure that the fitting is properly connected, which minimizes install errors that cause potential leaks points. The system is safe to use on pipes with drinking water. Plumbers, installers, and building professionals are able to plumb without special tools, soldering, crimping, or glue. As a result, efficiencies are increased and potential errors are minimized, the company says. When installed as a comprehensive plumbing system using other SharkBite products, the system is the only total rough-in plumbing solution from meter to fixture, according to the company.